Department stores are struggling, but J.C. Penney has posted the best sales growth in the industry in recent years. Moreover, it would probably be the biggest beneficiary if Sears goes out of business. After a run of strong sales growth during 2014 and 2015, J.C. Penney (NYSE:JCP) got caught up in the broader department-store slump last year. Comparable-store sales were flat in fiscal 2016. That was far better than the industry average, but it still represented a big step down relative to J.C. Penney's 4.4% comp sales increase in 2014 and its 4.5% increase in 2015. Management also has a very cautious outlook for 2017, with guidance calling for another year of flattish comp sales. Investors have punished the stock greatly for this sales slowdown. 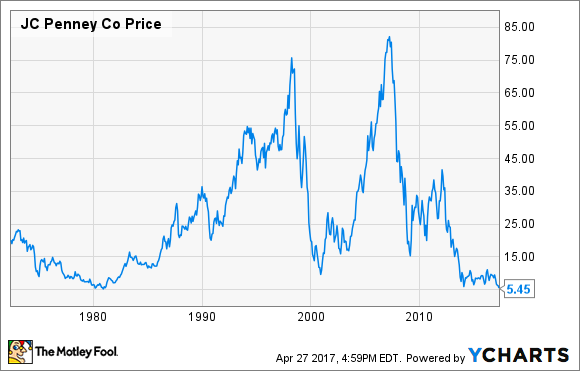 In fact, J.C. Penney stock hit a new multidecade low of $5.40 on Thursday. J.C. Penney long-term stock performance; data by YCharts. Yet from a long-term perspective, J.C. Penney has one big thing going for it: Top rival Sears Holdings (NASDAQOTH:SHLDQ) appears to be in a death spiral. J.C. Penney stands to gain a significant amount of incremental business if Sears goes bust. As a result, I more than doubled my stake in J.C. Penney last week. The slowdown in sales at J.C. Penney is certainly disappointing. But some of this slowdown relates to product missteps that have already been addressed. J.C. Penney is reducing the time to market for its private-brand merchandise, which will help it better react to changing consumer trends going forward. Furthermore, J.C. Penney continues to improve its profitability year after year by cutting costs. It reached the breakeven mark in fiscal 2016 and expects to earn a modest profit this year, thanks in part to the planned closure of 138 underperforming stores. 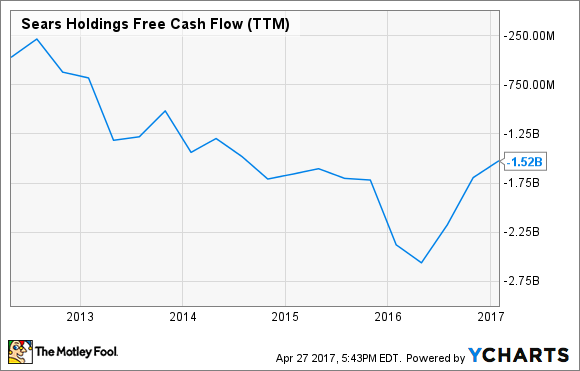 In addition, free cash flow has been consistently positive since 2014. In 2017, J.C. Penney expects to produce substantial free cash flow, totaling $300 million to $400 million. Some of that amount will come from asset sales, but the strong cash-flow forecast mainly reflects rising profitability and working capital improvements. Sears Holdings is J.C. Penney's most direct competitor in the mall-based, mid-price department-store segment. Sears' business has been in decline for more than a decade, but in recent years it has taken a serious turn for the worse. Comparable-store sales plunged 9.2% in fiscal 2015 and another 7.4% in fiscal 2016. These persistent sales declines have more than offset Sears' cost-cutting efforts in recent years. As a result, Sears has been burning cash at a rapid rate. Free cash flow has come in at around a $1.5 billion deficit per year lately. Sears has been steadily selling off assets over the past few years to stay solvent. However, it is running out of real estate and private brands to sell. To make matters worse, its asset sales appear to be spurring further sales declines. Sears recently stated that comparable-store sales have plummeted 11.9% since the beginning of fiscal 2017. Based on its current asset-sale pipeline, Sears will probably be able to raise enough cash to stay in business for another couple of years. However, it's becoming increasingly clear that there is no profitable "core" business at Sears worth saving. Thus, when the company runs out of money, it's likely to be liquidated rather than restructuring in bankruptcy. J.C. Penney is deliberately positioning itself to capitalize on Sears' demise. Its most visible initiative along these lines has been the introduction of appliance showrooms in more than half of its store base. J.C. Penney is also testing new "Home Services" offerings to capture a piece of rising consumer spending on home remodeling and repairs. J.C. Penney is setting itself up to take market share from Sears. Image source: J.C. Penney. In the short term, J.C. Penney will benefit from Sears' continuous downsizing. It may also gain share from other retail bankruptcies, such as the ongoing liquidation of appliance and consumer-electronics retailer hhgregg. Thus, while sales have stagnated at J.C. Penney, the company is relatively well positioned to get sales growing again later this year. An even bigger windfall could come a few years from now, if Sears is forced to liquidate. In the meantime, J.C. Penney can use its free cash flow to steadily reduce its debt. Despite these substantial opportunities, J.C. Penney's market cap has fallen to a mere $1.7 billion -- less than 0.2 times sales and about 10 times forward earnings. If J.C. Penney can produce even modest sales growth over the next several years, the stock could surge.